The photo Below above was taken in England in the summer of 1951, during the filming of The Story of Robin Hood and His Merrie Men. Walt and Lillian’s visit to England that summer was the second of the extended trips to Europe they made with their daughters, Diane and Sharon. (The first such trip was in 1949, for the filming of Treasure Island.) That’s Robin himself, Richard Todd, at Walt’s right, and Maid Marian, Joan Rice, at his left. The above picture was taken at Burnham Beeches where scenes were being filmed. In an interview, Richard Todd spoke of Walt Disney as something of a “social climber.” For whatever reason Richard Todd was extremely well connected in British society of the day, to interesting and high-ranking people who Walt would have otherwise had difficulty meeting. One of them was Henry Tiarks, a merchant banker who was married to a West End actress and whose daughter ultimately became the Duchess of Bedford. Walt Disney was a very keen miniature railway enthusiast and had his own railway at his home in USA. One day whilst visiting London on business and as he had completed his work asking his chauffeur if he knew of any miniature railways in London, the chauffeur brought Walt Disney to Ridgeway Park in Chingford. That day the park was holding the Chingford Day celebration. Walt Disney drove trains around the track and allowed the press to take some photographs and generally had a good time. 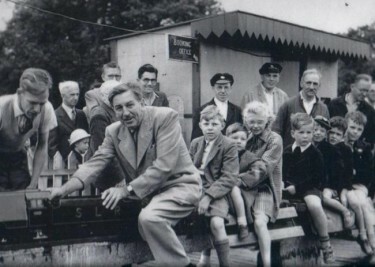 When the public heard that Walt Disney was visiting the railway every body rushed over to see him, just as the Mayor of Chingford was about to open the celebration which he did almost on his own. Note – The caption above gives the date as 1954 and on this same picture elsewhere I have seen 1952 – IN FACT I am fairly sure that this was taken during Walt Disney’s visit to England in the summer of 1951 to film The Story of Robin Hood and His Merrie Men at Denham Film Studios.